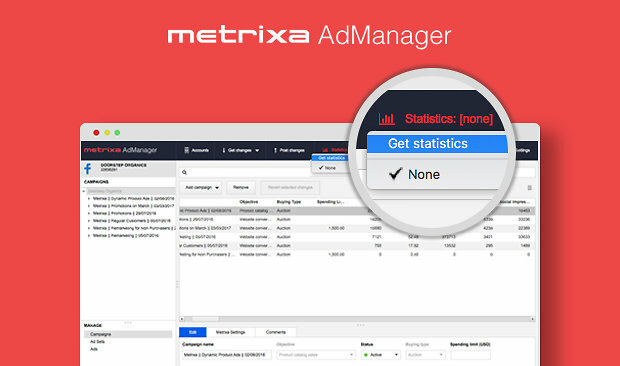 Metrixa AdManager lets you manage your Facebook Ad Campaigns quickly, easily, and from anywhere. Today's tutorial is about how to download and view statistics and customizing your columns. To customise your columns, change the view in the bottom left panel, and choose the 'columns' icon at the top right corner. Tick (or untick) the columns you want to add or remove from the main panel. Remember to save and post your changes back to your live Facebook Ads account when finished. It’s important to review your performance and statistics before making any changes to your facebook ad accounts. Metrixa makes it really easy to download statistics and make changes at the same time. In this tutorial, I‘ll show you how. Click on the statistics dropdown. This dropdown will show you any recent stats that you’ve downloaded. You can use this to switch between different sets of stats quickly. You’ll then be able to select which campaigns and which ad sets you want Data for and what date range. I’m going to choose all campaigns and last 30 days. When you’ve made your selections, click ok, and AdManager will start downloading stats from your Facebook ads account. Metrixa will save the 5 most recent sets of statistics that you download, which means you can switch between different sets of stats quickly without having to download them again and again. When stats are downloaded, the next thing you’ll want to do is customize your columns so that you can see the statistics that you really want to focus on. To customise columns for a particular view, change the view in the bottom left panel, then click the columns icon at the top right. You can tick or untick any columns to add or remove them from the main panel. With your columns customised, you’re ready to start analysing your campaigns, ad sets and ads and making informed decisions when editing. If you'd like to see more Metrixa AdManager tutorials, subscribe to our YouTube channel, or visit the resources section of our website.